According to Ronnie James Dio‘s Facebook page, today marks the seventh year anniversary of the legendary singer’s last c0ncert. Ronnie James Dio played his last show as part of Heaven And Hell with guitarist Tony Iommi, bassist Geezer Butler and drummer Vinny Appice in Atlantic, New Jersey, USA on August 29, 2009. This is video from Ronnie James Dio’s final concert ever fronting “Heaven & Hell” (aka the Dio version of Black Sabbath). It was in Atlantic City, NJ on August 29, 2009 – the final date of the “The Devil You Know” tour. 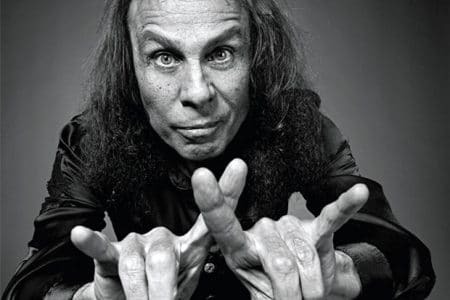 Ronnie James Dio, whose soaring vocals, poetic lyrics and mythic tales of a never-ending struggle between good and evil broke new ground in heavy metal, died of stomach cancer on Sunday, May 16, 2010 at the age of 67. Dio then replaced legendary vocalist Ozzy Osbourne in Black Sabbath in 1980 with the critically acclaimed album Heaven And Hell, considered by many critics to be one of the finest heavy metal albums of all time. His on-again, off-again tenure with Black Sabbath touched off an intense debate among fans as to which singer was the true essence of the band — a discussion that lasted until his death. Dio organized an all-star charity collaboration in 1986 called Hear N’ Aid to raise money for famine relief in Africa, styled on the successful “We Are The World” campaign of a few years earlier.